Dearly loved Husband of 19 years to Pam. Adored Step-Father of Gordon, Kylie and Roger. Loving Poppy of Travis, Jacob, Kayla and Rylan. You loved me and lived your life for me. You will be forever missed. A Funeral Service for the Late Mr Ronald Pearse-Pryor of Maddington will take place on FRIDAY (12.4.2019) commencing at 2.00pm, preceded by opportunity for viewing from 1.00pm in the Hetherington Funerals Chapel, 79 Kelvin Rd, cnr Maddington Rd, MADDINGTON. 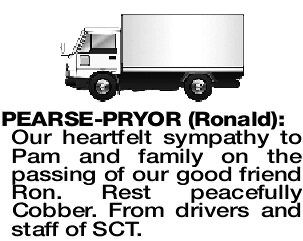 With sadness we say goodbye to Ron. Brother- in-law to Robert and Colleen (dec). Uncle to Kellene, Simone and Richard. Friend of Lois. All our love to Pam and family. 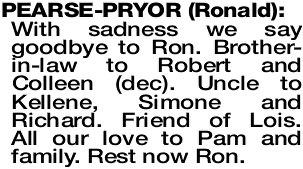 Rest now Ron. 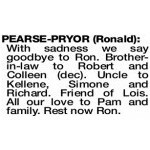 PEARSE-PRYOR RON Our deepest sympathy to Pam and family on the sad passing of Ron. Cheers mate, you'll always be in our memories. 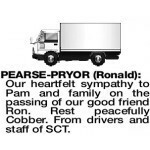 Our heartfelt sympathy to Pam and family on the passing of our good friend Ron. Rest peacefully Cobber. From drivers and staff of SCT.